As hearing aid technology continues to evolve, choosing the right style of hearing aid may become more challenging. At Hearing Associates, located in Mason City, the surrounding areas in northern Iowa, and Albert Lea, Minnesota, we understand that each person experiences hearing loss differently. We offer a wide variety of hearing aid styles, to meet your unique needs. Our expert staff uses the results of your hearing tests as well as your lifestyle needs, budget concerns and any cosmetic considerations you may have to help you choose the best hearing aid for you. Because every hearing aid style is not suitable for every person, we carry a variety of hearing aids, each style with its own advantages and limitations. 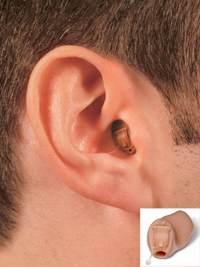 Completely-in-the-canal style hearing aids (CIC): The smallest and most discreet. These fit completely in the canal and are made to fit your ears. There is a clear nylon post to help with insertion and removal. They are powered with a #10 hearing aid battery. In-the-Canal style hearing aids (ITC): Larger than the CIC devices. These fit within the ear canal and are custom-made. They are powered by a #312 or #10 hearing aid battery. 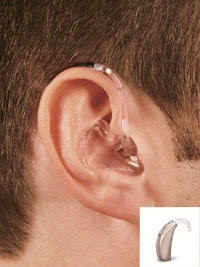 In-the-Ear style hearing aids (ITE): Fit in the "bowl" of the ear. Made to fit your ears, the lightweight and compact size makes these instruments comfortable and easy to manage. They are powered by a #13 or #312 battery. 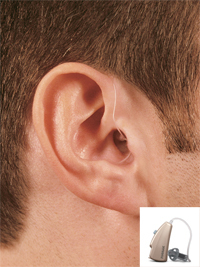 Receiver-In-The-Ear (RITE): Similar to conventional BTE devices. 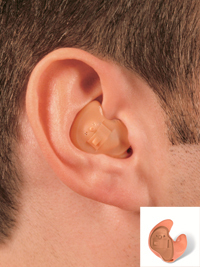 These types of hearing aids are much smaller, and more discreet than the BTE style. A very small tube leads to the ear canal making this option much more cosmetically appealing while offering superior sound quality. 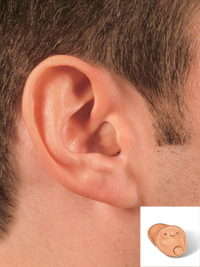 Behind-the-Ear style hearing aids (BTE): Largest modern hearing aid. The processing components are housed in a case that fits behind the ear. Sounds enter the instrument, are amplified, and travel through a tube that is contoured over the top of the listener's ear and into an earmold inside the ear. BTEs are durable, easy to handle and maintain, and can be easily adapted for use with the wide variety of assistive listening devices.